If you are going to spend any amount of time at a job (you can choose your own definition of job - it doesn't necessarily mean where you get your paycheck), whether it's 10 hours or 60, you should enjoy what you do. Most people spend more time working than they spend with their family and friends. More time at work than focusing on their health. Enjoying their hobbies. Playing with their dog (the one who looks longingly out the window waiting for their person to come home). Friday was my last day at my current property. I've worked there for a little over 5 years. For the past 3 years, I've been in what I consider the "Fun & Games Department." The sole focus of my position was making sure that our employees had a great workplace and were equipped to successfully do their jobs. I may not like my alarm clock, but I never dread going in to work. I have fun every day. I read the quote above and think that Confucius really did know what he was talking about. If you love what you are doing, no matter what it is, it doesn't feel like work. I think about my friend who loves to run marathons and half marathons. I look at that as a punishment. He thinks it's fun. Training for a marathon is work. But if you love the run, it won't feel that way. You'll make time for it. For the past 12 years, I've worked for the same company. Four different properties. Ten different job titles and responsibilities. Each position was challenging. Each position was fun. I look forward to starting my new adventure on Monday. Another day in my life where I will never have to work. 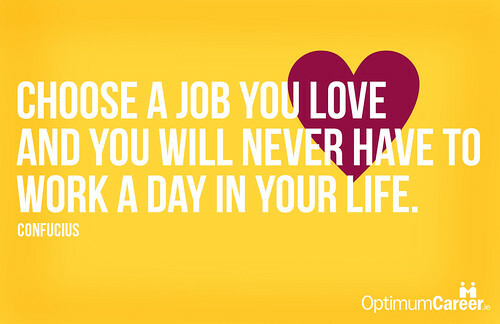 What does it mean to choose a job you love?